Often times when creating your own user style, you may want to use the same fonts used by your theme in your action box. This guide will show you how to make custom fonts available in the font selection drop-downs when you create your own user styles. 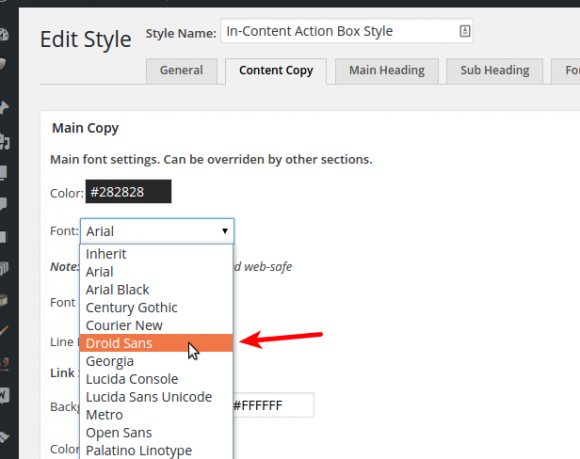 This how-to assumes that the font is already loaded on your website either by the current theme or by another plugin. If the font is not loaded, then no matter how faithfully you follow this guide, it won’t work. Knowing the name of the custom font you want to use is important as this will be the value used in the drop-down. 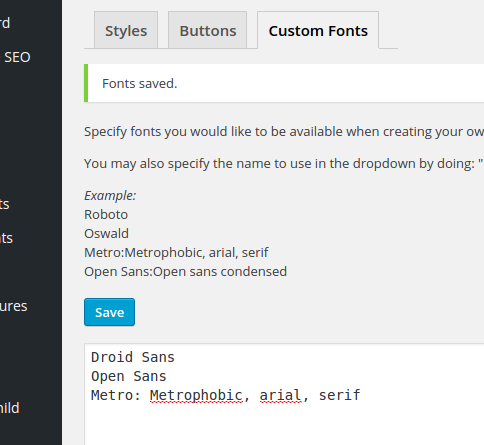 In this how-to, we will be using a Google Font named Droid Sans. In your WordPress Dashboard, go to Magic Action Box → Styles & Buttons then click on the Custom Fonts tab. Enter the font name – in this case Droid Sans into the textarea field. As written in the field description, you may specify multiple fonts by typing each font name on it’s own line. Now, edit your user style or create a new one. Then go to any font selection setting like say Content Copy tab → Main Copy setting and you should now see the custom font available you specified earlier.